The amazing thing about film is that it can literally play with your emotions. Specifically in the case of documentary, someones version of the truth can irritate and annoy you, their perspective can conflict with your own, and even their style can be challenging to grasp and understand. 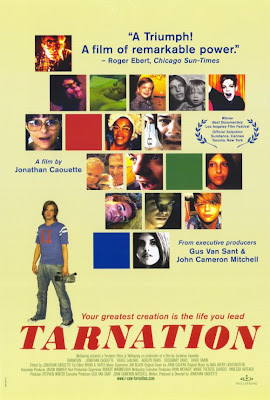 I felt a mixture of all these things in trying to appreciate Jonathan Caouette's very personal film, Tarnation (2003). Based on the premise alone I felt Caouette's documentary was intriguing. 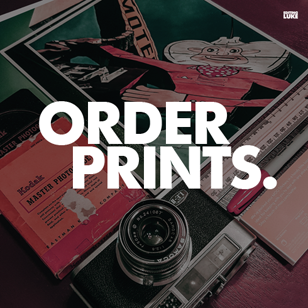 With a tagline like 'your greatest creation is the life you lead' and a documentary assembled from two decades of home video, answering machine messages, photographs, personal confessions, and scraps of pop culture, the setup is made to be epic. Our subject is Caouette himself and his relationship with his schizophrenic mother. Right off the bat we're treated to intense and challenging cuts, filters, and mashups. It felt like something I might have put together when I was 13 and just discovering editing software - I wanted to use every filter available, not caring if they conflicted. This styling is bold in the case of Tarnation, and it set the tone of what was to come. Caouette loves to see himself on camera, and this quickly became another obstacle for me when trying to understand the message of the film. We're treated to long staring sessions, which add to the avant-garde nature of the documentary. The mental condition of his mother, and the complicated nature of their relationship can be argued as the reasoning for this approach, but even at its weakest it's constantly bordering on masturbational cinema. I was always questioning why do you want me to know this? I'm still not entirely sure of what Caouette wants us to take away from his experience (outside of admiration for his situation) and how that meshes with my interpretation of it. Jonathan Caouette is so dramatic and even in his early home video clips he's so eager to play to the camera that it sabotages his live efforts to be sincere when the moment itself seems genuine. His sexuality as a gay man and his troubled childhood begin to feel more and more focused on clamouring for some intangible acceptance than it does about revealing a deeper meaning regarding the state of his mother. Let there be no mistake, the film is about Caouette. And this wouldn't have bothered me if the story wasn't sidelined by attention seeking gimmicks. The story, as patched and ambitious as it is, ultimately fails to give us a broad enough context to actually appreciate and empathize with the subjects for very long. The entire project ends up feeling like a film school experiment where pieces were just thrown in to see how someone else might interpret them. And yet despite all these things, Tarnation was a documentary that I found myself thinking about a lot. Only because of it's challenging nature and because of my film school background did I feel the need to try and confront the elements of the film that bothered me, but in the light of the mainstream I can see a lot of people simply turning it off because of how different and uncomfortable it is. The essence of great film making is not about how enigmatic it can be or how many meanings can be pulled from the final product, but instead about how effective its construction is in getting the viewer to appreciate, understand, and hopefully inherit the emotions and information you're trying to convey.